Since the ‘Open door policy’ was implemented, competition between cities to attract foreign investment was becoming more and more crucial. Driven by this trend, local authorities prioritise their city development agenda on attraction of foreign firms to meet the demand from the global economic system. Through the circulation of knowledge flows, technology flows, and capital flows, cities acquire the nutrition from ‘Global pipelines’ and exchange the local knowledge with MNEs. Hence, economic activities and location attributes to some extent determine the spatial agglomeration of multinationals. The agglomeration of multinationals has meaningful implications for local development, because of the huge amount of foreign direct investment (FDI) operation undertaken by MNEs in all industries and services. This study suggests to combine geographic proximity from FDI location theory and traditional location theory with agglomeration theory to explain the foreign firms’ agglomeration in the sector-region topic. There are some prerequisites need to clarify here. Knowledge flows are assumed to be acquired by co-located firms. Each cluster provides ‘open membership’ (knowledge sharing is transparent and noticed) to each firm. Firms that have higher degree of connectivity (many firms surrounding them) receive more knowledge from the network. In some models, firm size is not regarded as atomistic, and turnover will be used to capture firm-size. Geographically weighted measures are introduced to capture the effect of local clusters on MNE’s agglomeration. Through the use of different analytical techniques, the study examines the effect of diverse local sectors and proximity on the location choice of foreign firms. Furthermore, the study tests the effect in different conditions, with different bandwidths and firms’ turnover. Location factors are also included in the research framework. This study provide an integrated location perspective on foreign and local firms, hopefully trigger the further discussion on co-agglomeration issues between different disciplines. Specifically, the discussion of logic behind foreign firm’s spatial decision is a contribution to existing knowledge body, such as whether relatedness of technology and different geographical proximity are the determinants to their spatial agglomeration. It also provides an empirical evidence from China to illustrate the emerging phenomena since China has already been the biggest FDI receiver in the world since 2014. The research identified several findings: (1) significant county clusters are identified based on co-agglomeration of foreign and local firms. There are three significant clusters: Shanghai cluster, Suzhou cluster and Hangzhou clusters. The outlier clusters are different in Jiangsu and Zhengjiang province, there are several isolated significant clusters in northern Jiangsu, but a connected economic block exits in southern Zhejiang. (2) Spatial concentration of relatedness (within sectors) and unrelatedness (between sectors) Foreign firms prefer to locate in local clusters who own the similarity of technology and knowledge with them. What’s more, HT foreign firms tend to locate in HT and medium HT local clusters. (3) One firm’s medicine is another firms’ poison in attracting foreign firms. In the diversity agglomeration, some firms get benefit by co-locating with other firms, but some might be harmed by it. This argument is supported by the empirical researches in Netherlands, the heterogeneity of agglomerations on firm performance are strongly moderated by firms characteristics (Knoben, et al., 2015). (4) The U-relationship between foreign manufactures and local KI services agglomeration and proximity. (5)High speed railway station is strongly related to the locality of foreign firms. 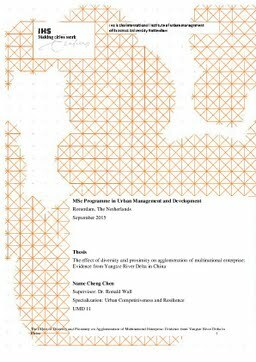 The findings of the thesis will provide policy makers a clear picture of co-agglomeration patterns in Yangtze River Delta. In addition, local governments who adopts policy of encouraging FDI by foreign firms has a reference to conduct their spatial plan in their territories.